Usually after I pick Oliver up from school at noon, I take the boys to a park down the street. It’s a great park with two play structures, a big baseball diamond, and trails that loop down to the neighborhood below. They are perfect trails for kids because while they end at busy sidewalks, the short trails themselves are overgrown and a little dark. “Did you know that this is a rain forest?” one of Oliver’s friends asked me a week ago when he came with us on our walk. “Lions live down here.” Together Oliver and his friend walked over a tree that had fallen across a shallow ravine, and for a few minutes, they sat there, their legs straddling the tree as if they were on horses, talking about whatever five-year old boys talk about. But on Tuesday, the boys and I were alone. We had the park to ourselves and went down the trails that now smelled of summer. It had been raining and was so humid that white spots of mold covered the ground. There was the delicate scent of honeysuckle. There was the sweet stink of dead animal. The boys ran on ahead, Oliver stumbling on legs that have suddenly grown too long, and Gus following steadily behind on his sturdy calves. I wanted to love this moment. But I was too exhausted. I was swatting mosquitoes. I was worried that a muskrat-like animal would pop out in front of us. I was feeling a bit overwhelmed by all I had taken on lately. Mostly I was annoyed at myself. For the two years I lived in Ventura, I learned how to simplify, how to pare back and slow down. And in just one year in DC, I have learned to spread myself back out, to sign up for too much, and say no to too little. Lindsey recently wrote about how there sometimes isn’t enough of her to go around, and that was exactly how I felt on Tuesday. Like I was having endurance issues. Like parenting was just one more thing that I had to cross off the list. 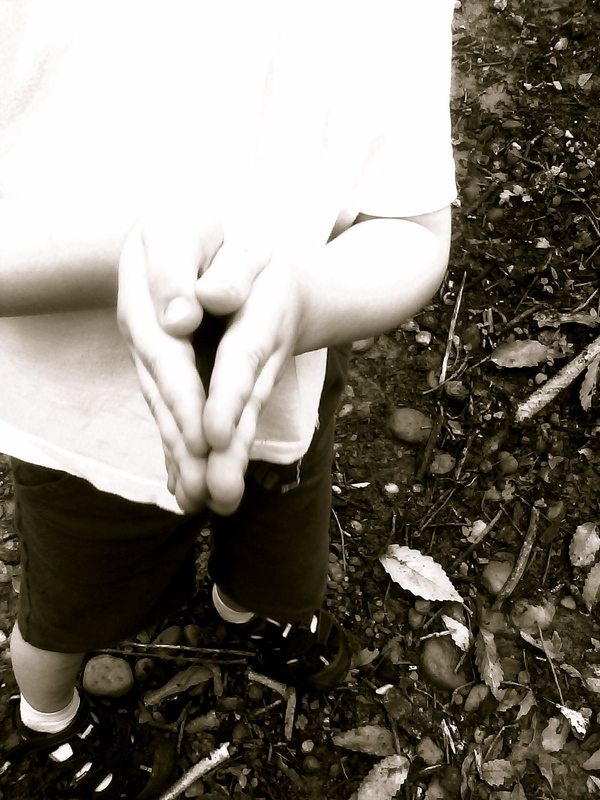 Just then, Oliver raced by me on the trail, his arms outstretched in front of him and his palms pressed together. He was making engine noises and weaving back and forth. ZZZooom. BBBrrrooom. I knew he was pretending to be in a space ship, but really, he looked like a very short pilgrim racing to Mecca. It looked like he was praying. Oh my God, I thought, feeling a chill go through me, which happens whenever the boys share a secret from their world. The hairs on my arms stood up, because frankly, these frequent instances seem more than just coincidences. Their connection with Spirit is almost too strong to bear. I placed my own palms together at my heart, the way I do during a yoga class, and inside my chest, a door swung open. Why didn’t I do this more often? Why didn’t I pray? Sure, I sometimes said a prayer when I was desperate, something along the lines of “Please God let that hair I just plucked out of my chin be a one-time fluke.” Or “Thank you God for Gus not screaming anymore.” Or “Please God let no one make a comment that my kids are eating pb&j again.” But these aren’t prayers. They are desperate pleas. Negotiations. The only time I pray is when I am on my yoga mat. I hardly ever pray when I really need it. The boys stopped ahead of me in a clearing. Down below I could see a sidewalk and a street full of houses, but the boys thought we were in the middle of nowhere, on some great Tuesday safari, full of adventure. I kept my palms together over my heart and felt my Catholic childhood melt into my yoga practice. Namaste. In the name of the father and the son and the holy spirit. I thought of the metta meditation, which I have seen everywhere lately: May I be protected and safe. May I be peaceful and free. May I be healthy and strong. May my life unfold with ease. I held my hands, also in prayer, up to the sky. Maybe I should start steering this way too. This is so beautiful. Even in your moments of struggle you are incredibly, powerfully present. And the fact that you can capture it all to share with us…it feels like a blessing and a gift. I love what you see in the live, open moments of life we often run passed without noticing. Truly a blessing to see this world through your eyes! Yes – this is so resonant for me, Pam – right at the edge of what I can handle, when I feel like I’m going to crack or shatter, my kids will do something that yanks me back to center, to ME. And it sounds exactly like what Gus did for you. I agree, too, that they are somehow more connected to the spirit world, without the self-consciousness and baggage that can begin to define that relationship as we get older. Remember what Meister Eckhart says, about how the only prayer we really need is thank you. I’ve been struggling with my own “steering” lately. I had the same Catholic childhood as you I imagine (god forbid we miss a Sunday) but havent been to regular mass now in many years. Not since I have come if age and have been able to think for myself at least. The Catholic church has pissed me off more than once now, and I can’t bring myself to forgive them…now how Christian of me is that? My dilemma…I want my children to have the knowledge and education that I had, until they can make their own decisions too. I just feel so inadequate, so conflicted, so hypocritical. I’d like to get my “steering” fixed, I just don’t know where to begin. Yes to the yes! To praying and steering our rocketships where they are destined to go. I was with you every step of that jaunt through the rain forest, smells and sights and thoughts and all. I’ve been thinking a lot lately about prayer. (I also had a Catholic upbringing, which I combine with a flailing yoga practice.) And I think all the time about my kids and how much purer they are and closer to the idea of Spirit. Today, reading your post makes me wonder if everything they utter while on a rocket ship exploring a rainforest is a form of prayer; and we’re so stuck in our own heads that we miss the simple prayers available to us everyday. And maybe our kids are our closest connection to the infinite. The is noting so wonderful as when the spiritual touches us unannounced. Except, of course, when it flows through our children! Thank you so much for such a beautiful story. This post is exquisite, every word. You can certainly weave a tale, all while filling up a person’s heart with wonder. I’ve been thinking about praying a lot lately. Being raised Catholic you would think that it wouldn’t be so hard, but I feel like I’m not doing it right. How ridiculous is that? I take that to mean that I’m not doing it right for me, and you remind me her, to just do it. You are currently reading Prayer at Walking on My Hands.